You have to be seriously well-heeled to want to spend £3,500 on an 11-inch TV, but Sony's XEL-1 is so much more than that. For inside its diminutive frame lies an Organic Light Emitting Diode (OLED) display that promises to change the way the TVs are made forever. That statement might sound crazy when you consider the price of the Sony XEL-1, but OLED TVs are much easier - and therefore cheaper - to make than their LCD TV equivalents. That because OLEDs can be made from polymers that glow when light is passed through them - eliminating the need for fluorescent tube backlights and other components. Getting rid of fluorescent tube backlights enables OLED TVs to skinnier that any TVs we've seen before - the XEL-1, for example, is just 3mm thin. Samsung, Sony and others showed off their super-slim prototype as IFA 2008 last August. We're expecting to see more real world examples of sets you can actually buy at CES 2009. Because individual pixels in an OLED TV array only light when a current is passed through them, they have much a higher contrast ratio than either of their LCD TV or plasma rivals - black is really black. OLED TVs are also remarkable for their wide viewing angles and complete lack of motion blur or journey - picture quality problems that continue to bedevil its rivals - and also promise greater colour accuracy. Because OLED TVs lack a power-sucking backlight, they use a lot less power to generate moving images on screen. That's important for environmental reasons, because our current obsession with large flat panels is causing TV energy consumption to go up rather than down. OLED TVs are claimed to be 40 per cent more efficient than their LCD TVs rivals. Display life is also expected to improve drastically from its current 30,000 hours to nearer 75,000 hours by 2012. Literally. Future displays will be able to be printed onto flexible polymers - using inkjets no less - that will enable you to roll up your TV and put it in your pocket. It also opens up exciting possibilities for future mobile phone, laptop and MP3 player designs (we're looking at you, Apple). Industry pundits predict than OLED TVs will eventually take over from LCD and plasma TV technologies for all the reasons given above - and there is already a lot of momentum, investment and interest from display makers in the technology. 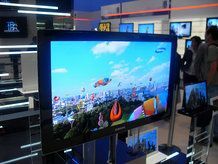 Market analysts iSuppi estimates there will be 240 million OLED displays in our hands and homes by 2013.